"Maggie, when you all made me door greeter, you changed my life. That moment was when I realized that I would be okay. I would be better than okay. You all showed that I mattered and was good enough to represent A Place at the Table every day at the door. You showed me that I had a purpose and was needed--something I hadn't felt in a long, long time." Mel came to us down and out. I remember vividly his first day in at A Place at the Table. He came in with a sad face. Well--he smiled, said hello, and introduced himself. However, I knew he was sad and something bigger was going on that he wasn't talking about. He asked if he could volunteer for his meal. Obviously, the answer was yes. I can't remember exactly what volunteer task he did that first day, but he didn't say much. A few days later, having volunteered with us daily, he started to open up a bit. He began to unveil his life story, tell us all about his kids, and share some of things he has been through the past few years. He began to chat with more and more volunteers, staff, and began to LAUGH. This was huge! We asked him if he would be door greeter because of his infectious smile and welcoming personality. He was on the fence about it. He did it once to cover for someone who didn't show and he absolutely loved it. He didn't just love it, but we loved it, our diners loved it, and every person that walked through our doors loved him. He began to ask folks how they were, what was going on in their days and began to make friends. People came just to see him! Mel is now a part of our family. He is traveling right now around the country to see his family, but we know he will be back to door greeting soon. We hear from him often checking in and seeing how the people he loves so much are doing. One of the people I admire is Brene Brown. She says, "A deep sense of love and belonging is an irreducible need of all people. We are biologically, cognitively, physically, and spiritually wired to love, to be loved, and to belong. When those needs are not met, we don't function as we were meant to. We break. We fall apart. We numb. We ache. We hurt others. We get sick." I believe Brene when she says we are wired to love, to be loved, and to belong. I believe this because I see it every day. Ya'll, there is something truly special about the community that is being built each day at 300 W. Hargett Street. It is authentic, real, and transformational for many of us. All of us in the world matter, have a purpose, and should be loved. If you are falling apart or feeling numb, please know we are a place for you. At 300 W. Hargett St. you will be greeted, asked how your day is, and handed a cup of coffee. Hey, maybe you will join Mel and door greet. Thanks to all who have made A Place at the Table possible for the Mels of the world, the larger community, and for myself. I can't tell you how crazy good this community is! Thank you for loving us and showing us we matter. AmazonSmile is the EASIEST way to support A Place at the Table. Go to smile.amazon.com and set up your charity as A Place at the Table in Raleigh, NC. Shop at smile.amazon.com. Amazon will donate 0.5% of the purchase price of eligible products. The products and prices are the same. The hardest part is remembering to go to smile.amazon.com instead of the regular amazon, but once you’ve signed up, Amazon will remind you. "Do you have three minutes? 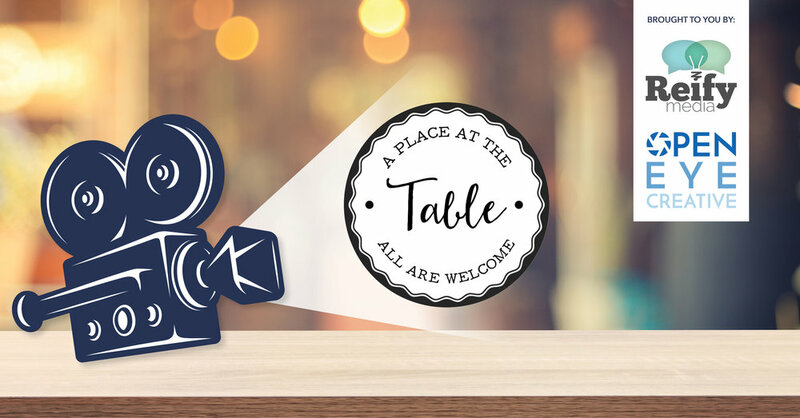 You're invited to share your thoughts on our new video explaining how A Place at the Table works. Our video partner would love to hear your thoughts – and I would personally appreciate it greatly! Watch the video and complete our short survey."